Capgemini Consulting is the Global Strategy and Transformation Consulting brand of the Capgemini Group. We specialize in advising and supporting organizations in transforming their business, from the development of innovative strategy through to execution, with a consistent focus on sustainable results. We offer a novel approach to leading companies and governments, using innovative methods, technology and the talents of over 4,000 consultants world-wide. Are you a talented, professional and driven graduate? Would you like to make a real impact in shaping and transforming businesses to meet future needs? 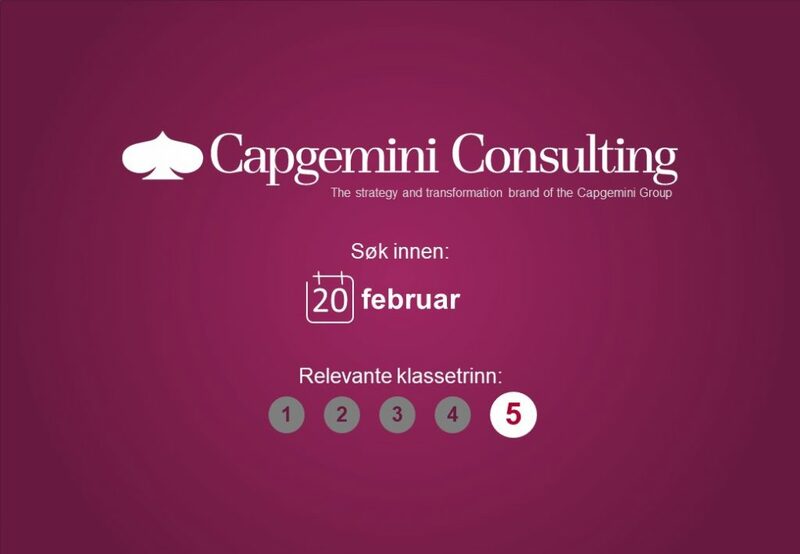 As a graduate in Capgemini Consulting you will become part of our Business Analysis Group (BAG), a unique graduate program that is designed specifically to provide you with the opportunity to learn and grow in the world of Management Consulting. Starting date for the graduate program is August 2018. Please attach your cover letter, CV, certified academic transcripts (including High School Certificates) and any other relevant documentation on or before February 20th 23:59 CET. Please attach your cover letter, CV, certified academic transcripts (including High School Certificates) and any other relevant documentation before 4th of March 23:59 CET.